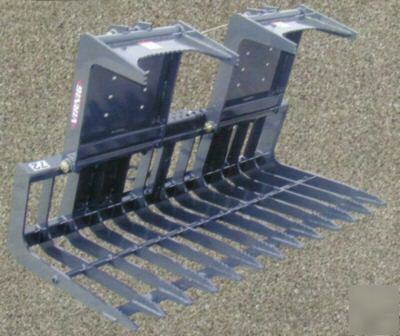 Brand New Virnig Model SGV84, 84" Heavy Duty Tine Bucket with Grapple. 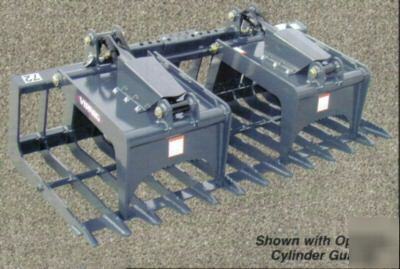 * This Tine Bucket/Grapple includes Hydraulic Hoses & Flat Face Quick Couplers, it complete & ready to use. * Overall Bucket Width - 85.5"
* Depth of Bucket - 39.88"
* Height of Bucket - 21.25"
* Tine Spacing (on center) - 6"
* Overall Grapple Width - 57.38"
* Height with Grapple Closed - 27.5"
* Grapple Opening - 37.63"